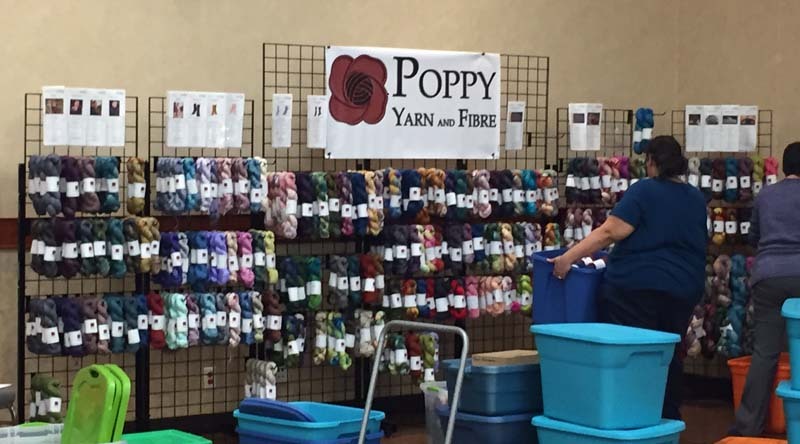 It was a beautiful, warm sunny day last Sunday when I headed north to the town of Lacombe for the Prairie Fiber Festival. It was the first year for the event and the organizers did a great job. While somewhat small, the variety and quality of vendors was excellent. They are off to a great start and I can only see it getting better. I was there when the doors opened and some of the vendors were still setting up. I had read online that some of the vendors would have limited stock, so I wanted to see everything. 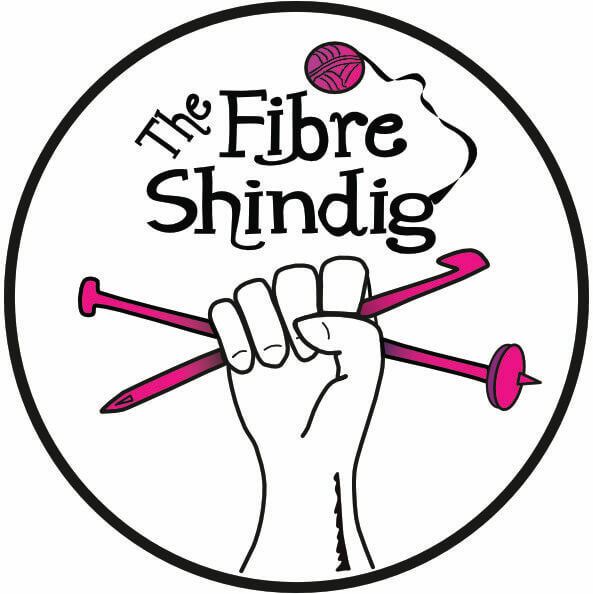 It was good to see what local dyers, spinners, woodworkers, etc. had to offer. 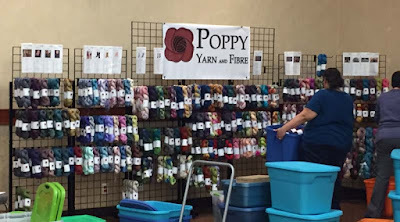 Poppy Yarn and Fiber, from Calgary, had some gorgeous colors and pattern support. 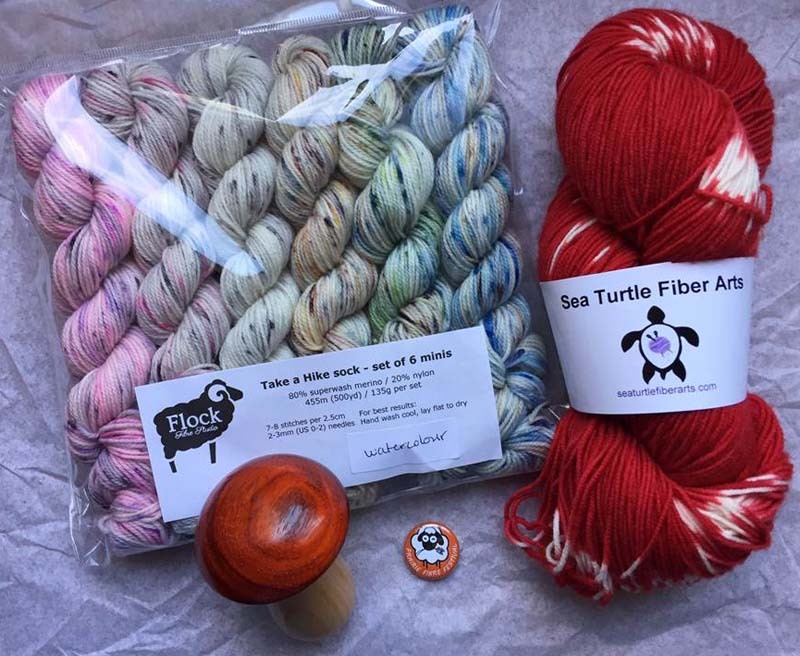 Also from Calgary was Sea Turtle Fiber Arts had a lot of temptations for me and I didn't resist - and added more when I got home. I was inspired by an incredible sunrise earlier in the day and they had a set of minis that I thought were a good representation of the sky that morning. More on that another time. I bought a skein of yarn that will go into my travel afghan to represent this trip, O Canada. It had been dyed to celebrate Canada's 150th birthday this year. One of the things that I liked and I thought was very clever were the little knitted cozies that were around some of the colorways so you could see how the yarn knits up. The O Canada yarn is in the middle, under the third "w" in the text, above. 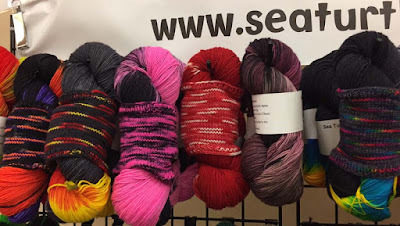 The Prairie Dye Studio had lots of yarn as well as Canadian-themed project bags. They also gave out little event pins to the first 100 people who came through the door. I got a cute little orange one. You can see it in the last picture. I had seen an advertisement by Flock Fiber Studio a couple of weeks earlier and immediately liked the set of speckled minis in Watercolor. I arranged to pick them up at the Festival. 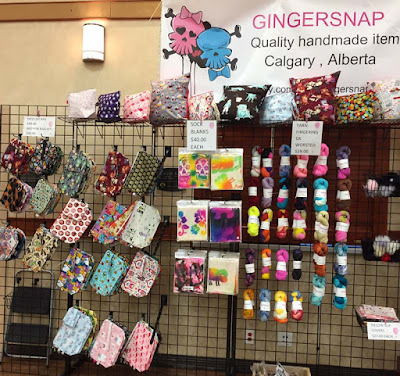 Gingersnap, from Calgary, had cute bags, sock blanks and some yarn. From what I heard people around me saying, Gingersnap would be sold out of items quickly. These are just a few of the indy dyers that were vendors at the show. All in all, there were probably 20, maybe even 30. I was particularly taken by the products and incredible quality of the items made out of wood by Danware, from Black Diamond, Alberta. I learned that "Dan" in the name was a nod to the home country of Denmark (pronounced Danmark in Danish). I would have loved to take home one of everything that was on display. The warmth and smoothness of the wood was wonderful. I picked up a mending mushroom. I didn't realize it until just last night that the top of the mushroom comes off and you can store your darning needles in the stem. 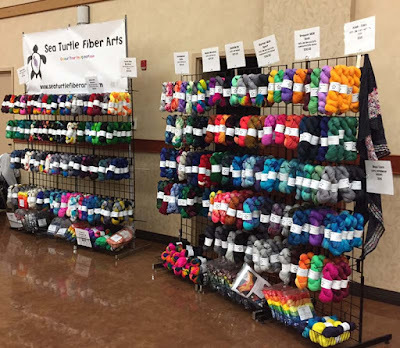 I've found that there are other fiber-related events in the area and the next one is in 3 weeks. 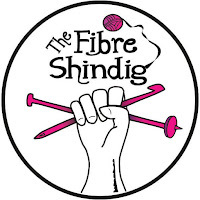 Of course, I'll have to go and check out the Fibre Shindig in Calgary. I don't think I've heard the word "shindig" since the music show that was on TV in the mid-60s. Did you happen upon the Airdrie dyers at the event? Mom dyes cottons....Creek Garden Crafts and daughter Shelley who dyes beautiful merino....Polka Dot Creek. They’ll be at the Calgary Shindig as well. Yes, I stopped at all the booths, including theirs. So many pretty things!